Capturing data: ACD systems that provide massive amounts of data must be manually typed into spreadsheets, inevitably resulting in typing errors and wasting the valuable time of call center supervisors who could be training agents, analyzing trends, optimizing schedules, and performing other productive tasks. Overstaffing and understaffing: The spreadsheet approach to forecasting and scheduling often leads to overstaffing and understaffing, which results in lower service levels and an increase in payroll costs. Customer satisfaction suffers when customers have to wait for long periods to get their issues resolved. 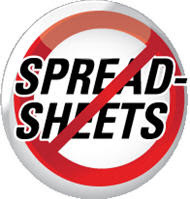 Schedule adherence: Tracking schedule adherence using spreadsheets gives managers headaches. It also needlessly wastes time and money whereas automated WFM solutions make it easy for agents to precisely follow their schedules. Shrinkage can become a huge problem for any size call center. For instance, in a call center of fifty agents, occupancy is critical. If five agents take breaks or go to lunch at the same time, occupancy decreases by ten percent and service levels go with it. An automated solution prevents this from happening by carefully optimizing agent schedules and forecasts, and sending alerts by out-of-adherence. A manager using a manual system may be tempted to hire additional agents, while the manager with an automated system has the data at his fingertips to accurately optimize future agent schedules to dramatically reduce shrinkage. Spotting trends: It is difficult to spot long-term trends over weeks and months with a manual system. This data is priceless for accurately forecasting and scheduling agents in the future, special events and other seasonal patterns. Agent retention: One of the many reasons agents leave is because staffing in a spreadsheet system seems random and fixed, while not considering their personal needs. Agent morale decreases and turnover increases when agents do not understand schedules and what’s expected of them. A spreadsheet based process might work for a few small contact centers, but it is clearly costly and wasteful in terms of time, money, and productivity for many others. Call center managers typically cannot wait to get their hands on a better solution to manage their workforce. The savvy ones are eager to present senior management with an automated workforce management solution to enhance efficiency, increase performance, and realize a high ROI. We will talk about ROI drivers in our next blog post, please stay tuned. In the meantime, you can also download a few workforce management whitepapers from our call center resources library to learn more.